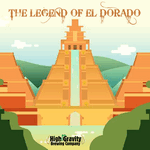 A quest for the golden haze will take you to El Dorado, where the hops are plenty and the beer is hazy. 9 ounces of treasured El Dorado, Mosaic, and Citra hops are added to this 5 gallon batch that is The Legend of El Dorado. This beer is brewed using nothing but whirlpool and dry hops. By adding all the hops after the boil the bitterness is smooth, not harsh. Tropical fruit and citrus flavors makes this a very juicy IPA that will not disappoint.